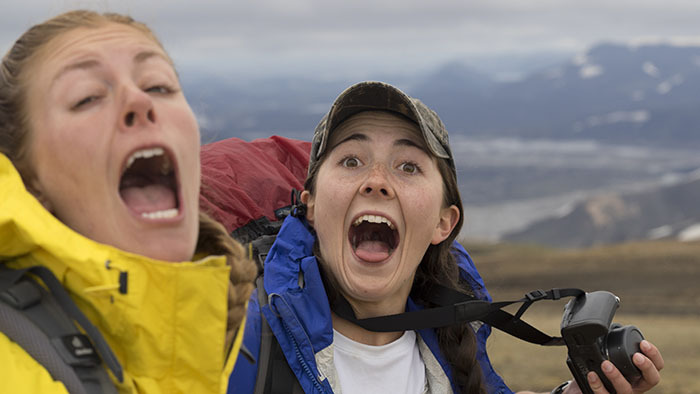 Who wouldn’t be excited to go to Iceland! We are excited to announce our 2017 field trip to Iceland and are even more excited to be able to offer it to current students, just graduated seniors and alumni. 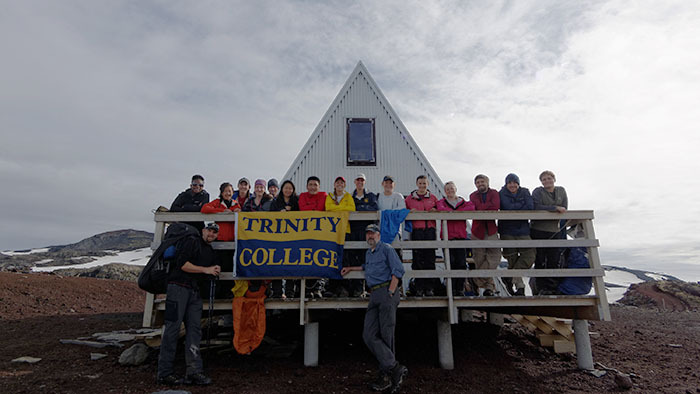 The trip will begin and end at Boston airport (alumni could arrange for different starting points), includes two days in Reykjavik and our classic hike along the Laugavegur. Taking sunset pictures in Reykjavik. The trip dates are Sunday, June 18 2017 – Friday, June 30 2016. The cost will be between $1750 and $2000 (more below). 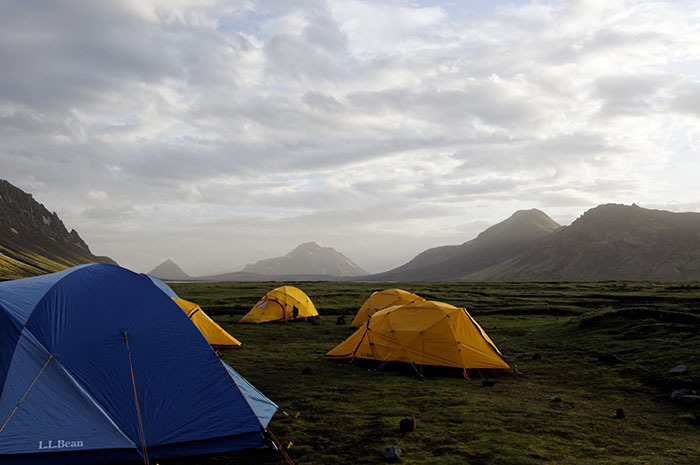 While in Iceland we will camp or stay in Huts (at Baldvinsskáli, Emstrur and Hrafntinnusker) that are operated by the Icelandic Touring Association (Ferðafélag Íslands). 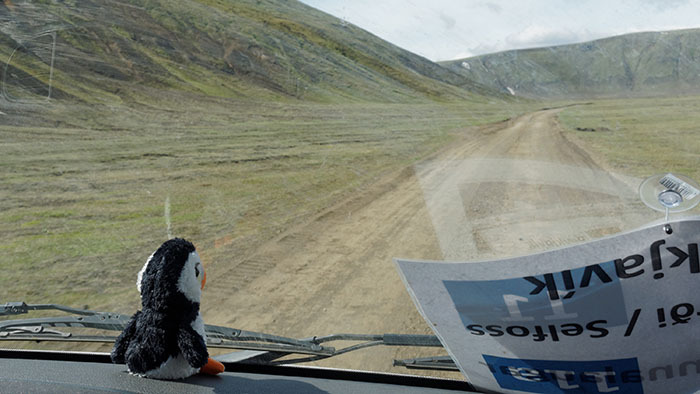 We’ve been to Iceland many times and the weather has ranged from super sunny and nice to driving rain and utterly miserable with everything in between – most of the time it’s pretty nice! 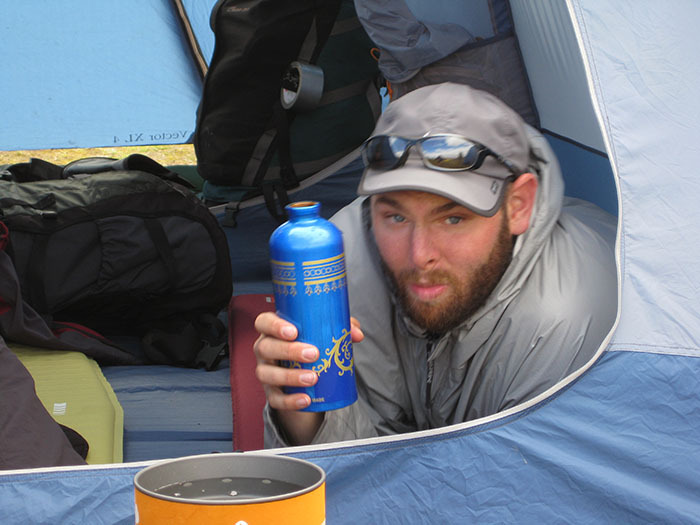 In any case, we supply the tents, but you should bring a good sleeping bag. Every once in a while we throw in some geothermal heat on top of a volcano. 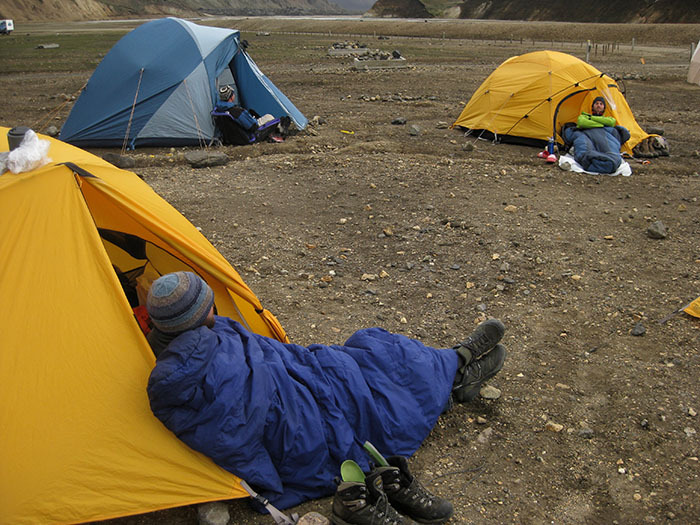 Camping in Landmannalaugar – the worst campsite of the trip, but the hot springs make up for a lot! 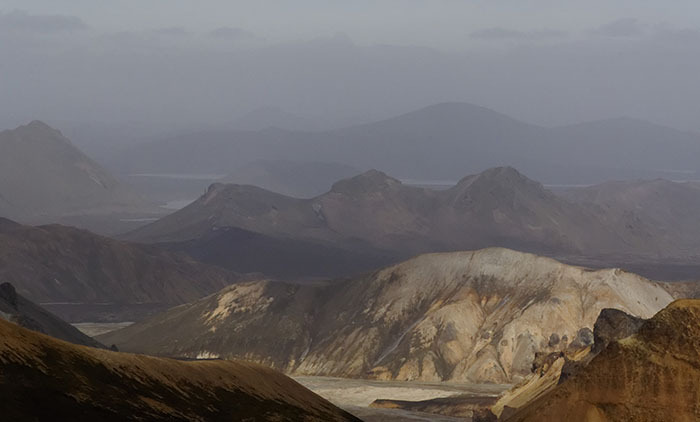 The rhyolite hills of Landmannalaugar. The total cost of the trip (between $1750 – $2000) dollars will depend a little bit on the cost of local transportation and airfare. We’re getting quotes for the bus right now, airfare will be influenced by when we are able to lock in the tickets. That price includes airfare from Boston (if you are an alumna / alumnus and want to meet us in Iceland lets talk), local transportation, all the food on the hike, and a visit to the Blue Lagoon at the end of the trip (overrated, but your fellow folks on the plane home will appreciate it). 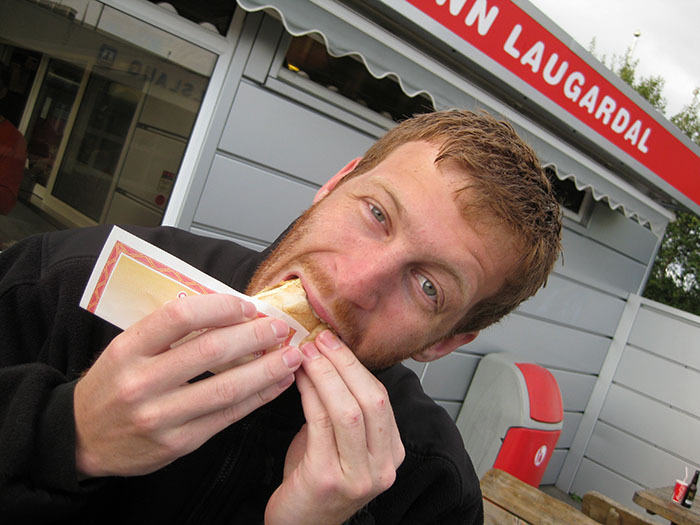 It will not include food in Reykjavik where you can enjoy the most amazing hot dogs ever or dine in five star restaurants on Arctic char, lamb chops and smoked puffin (supposedly rather salty). 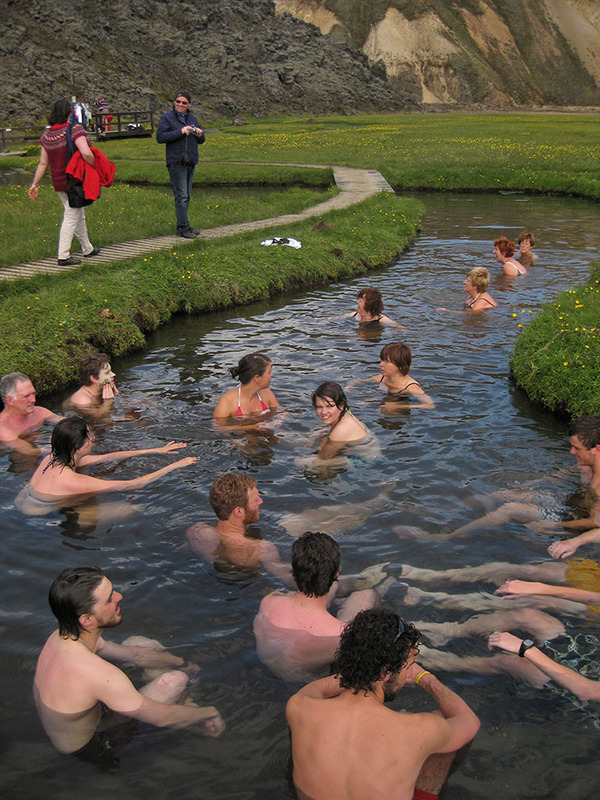 The centerpiece of the trip will be a hike from Skogar (on the southern coast) to the hot springs of Landmannalaugar. 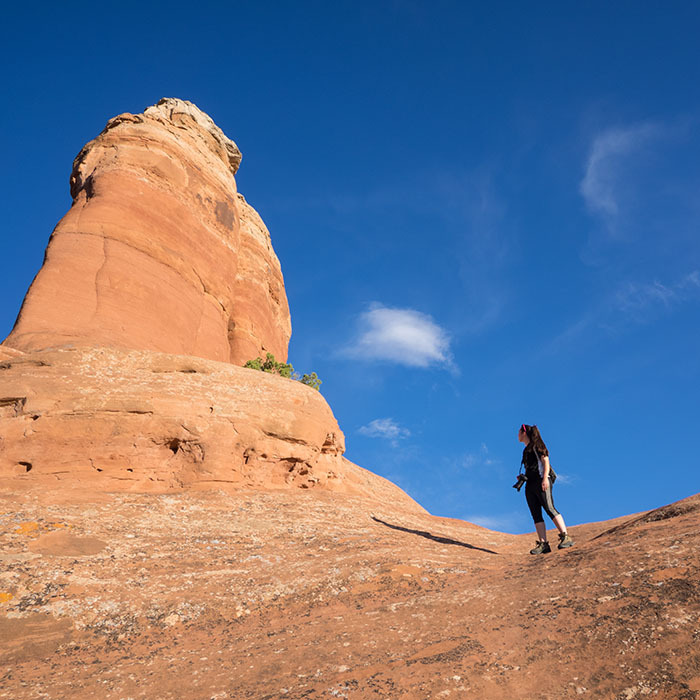 Daily hikes range from 8 – 10 miles a day, and we usually are in camp by early afternoon. That leaves plenty of time to hang out, relax, stalk the local flora or just tend that blister on your foot. Every once in a while we will have to ford a river. It’s exciting the first time, and at the end you’ll think nothing of swimming through glacial streams the size of the Amazon river. Piece of cake! OK, I exaggerate a bit: the rivers are just deep enough to earn some bragging rights (see below). Most river crossings are bridged. The ones that are not ain’t that bad. The water is well-heated and pleasantly refreshing. :-) Yeah, check out Jenna’s face. 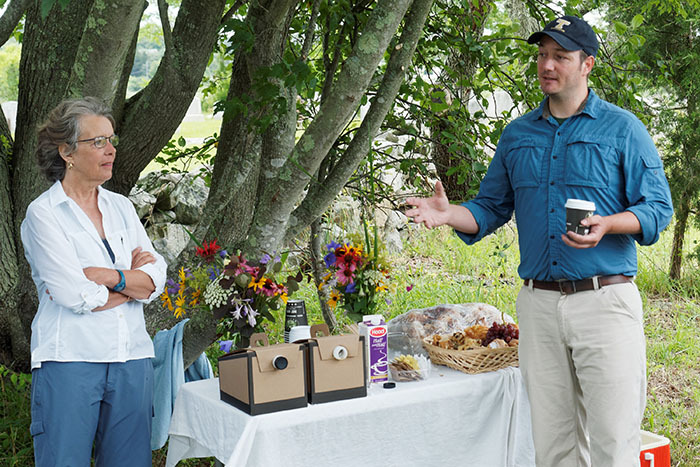 While on the trail we’ll do our own cooking. By now we have it pretty much figured out and we’ll chat with you guys about food choices, menu planning etc. The best hotdogs can be had right outside the the Laugardal pool, minutes from our campsite. 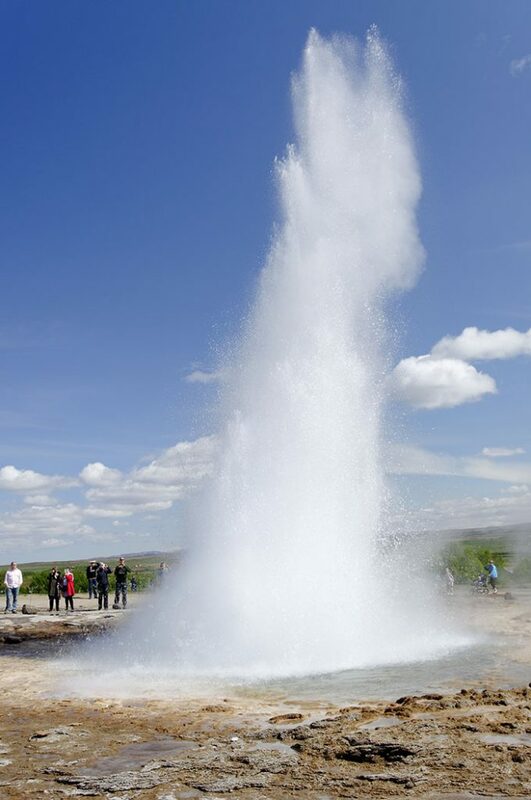 Strokkur, the local geyser going off every few minutes or so. 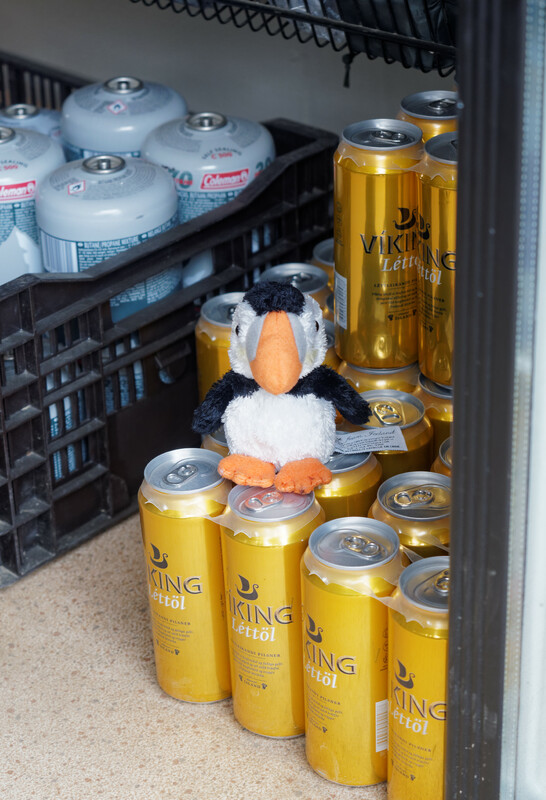 Wednesday, June 21 – today our hike begins in earnest: after a morning bus ride to Selfoss to stock up on last minute supplies we head east along the coast, where we might stop at Seljalandsfoss. Here you can walk behind a waterfall (also last chance for hot dogs, muffins, coffee). Then we begin our hike at Skogar with hundreds of steps straight up from the parking lot, hundreds of waterfalls, and a hut just under the glacier where we will spend the night. It’s steep, it’s long, the weather will likely turn on us halfway up, but once you’re at the hut it is sooooo worth it! Yes, we all fit, but Jon had to spend the night with a bunch of German girls. 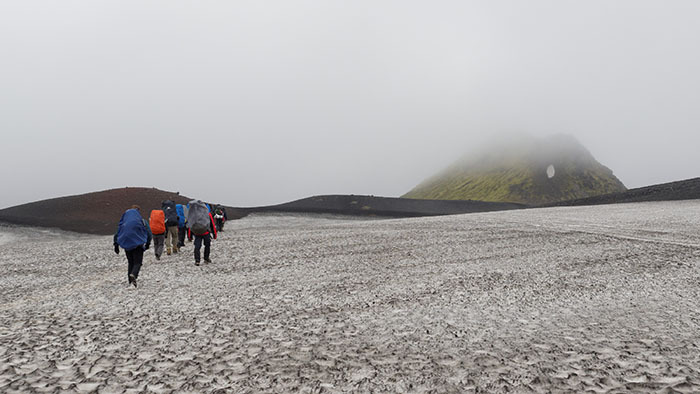 Thursday, June 22 – Today we hike through the pass at Fimmvörðuháls, where we will most likely encounter some snow and ice before we reach the two craters Magni and Modi (named after the sons of Thor), the site of the first eruption of the Eyjafjallajökull volcanic eruption. If you’re lucky the earth might still be toasty warm, years after the event. 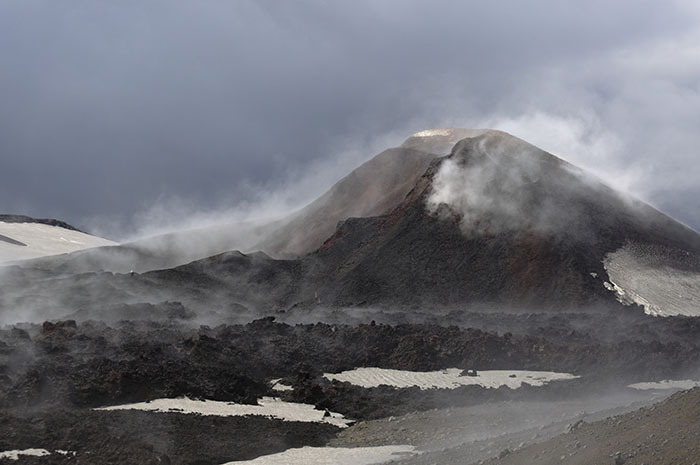 The steaming Magni crater in 2011. It was still pretty warm and toasty in 2014. From there we head down into Thórsmörk, where we camp in a nice sheltered campground near the hut. Thórsmörk, by the way, has the third largest flag in Iceland (according to the warden). Friday, June 23 – Today we stay in Thórsmörk. There are plenty of little hikes to do (Christoph still wants to explore the famous cave waterfall, which is the star of many German guidebooks, but which has escaped him now twice), you can head over the mountain to hang out at the next bar or just be lazy and relax after two days of hiking. Saturday, June 24 – We start the day with our first stream crossing (nothing to worry about) and then hike all day along the river Markarfljót, in sight of one of Iceland’s coolest mountains, Einhyrningur. When we’re almost at the hut as the crow flies we still have to go way down to the bottom of a steep gorge, cross a raging stream (on a bridge) and work our way back up the infamous Botnar Step before we reach our destination, the hut at Emstrur (Botnar). 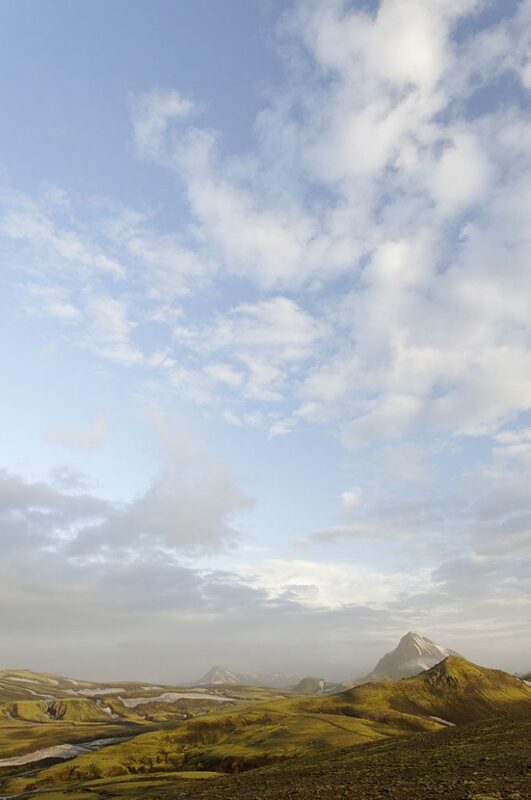 Camping here is so-so, and we’ll stay in the hut. So it might be better to go for an evening hike or take a nice hot shower. Monday, June 26 – Up to Hrafntinnusker! 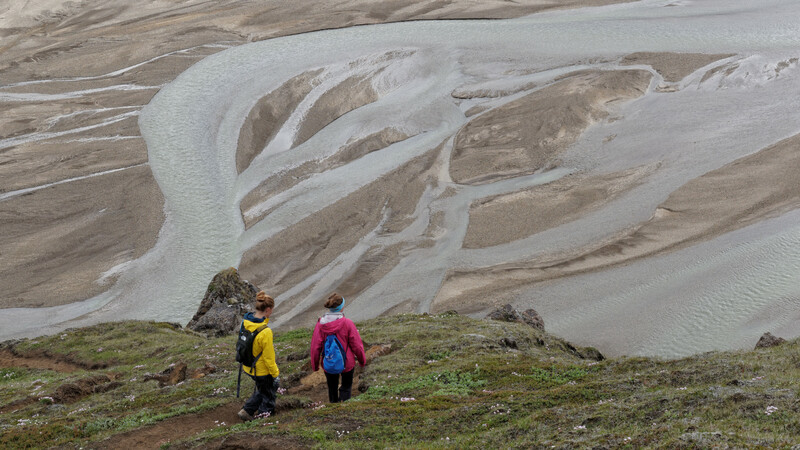 After a nice walk in the valley we climb up the side of a big caldera to go into the Landmannalaugar region proper. 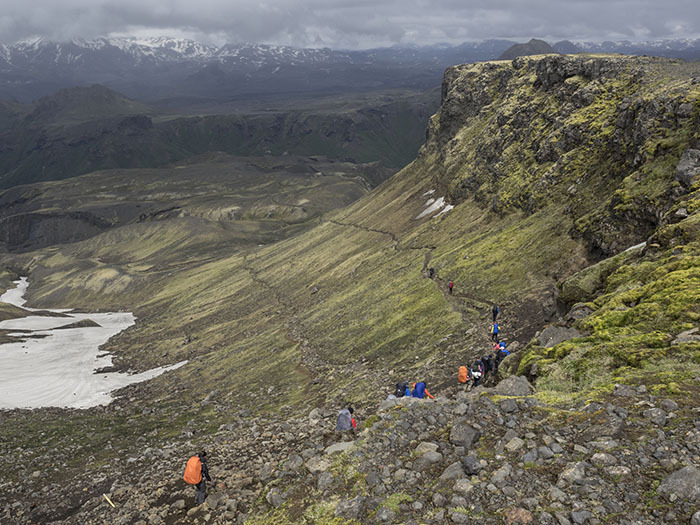 This can be a great hike with amazing views if the weather cooperates (with possibly a little side trip up to Háskerðingur, a really cool, but very steep mountain with an even more amazing view). In any case, we’ll stay at Hrafntinnusker. The camping here really stinks and that’s why we stay in the hut. 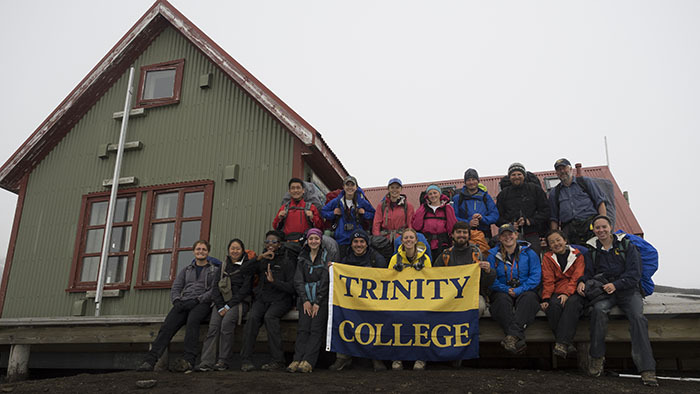 Out group at the Hraftinnusker Hut – we’re still looking pretty good after six days on the trail! 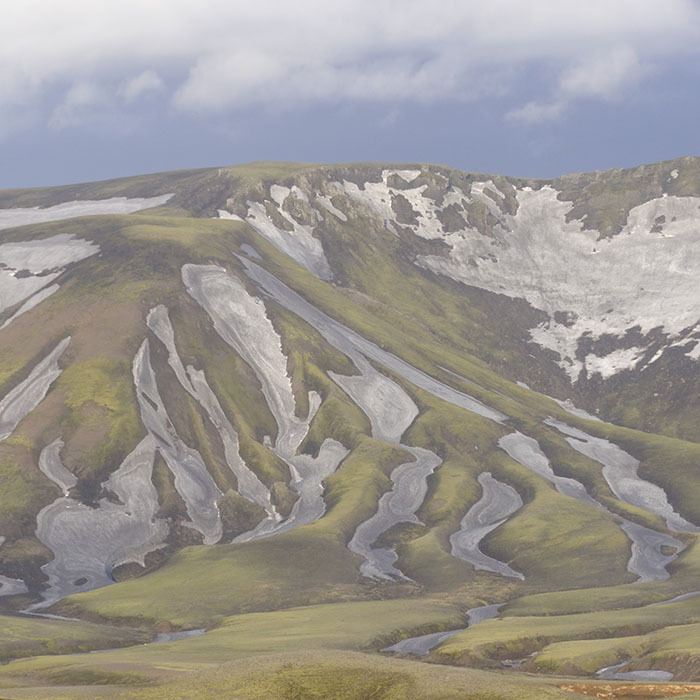 Tuesday, June 27 – Today we have one more ridge to climb before we head over the rolling rhyolite hills of Landmannalaugar, past the first hot springs (too hot, too muddy) and amazing lava flows. Just before we head down to the hut we have to descend a couple hundred meters. Here you can smile at the poor folks who have to crawl up the steep hill on their way to Thórsmörk. Don’t feel too bad for them – they have four or five days of amazing hiking still ahead of them… We head down to the hut, where we set up camp before we jump into the springs. Its a tough job, but somebody has to do it. 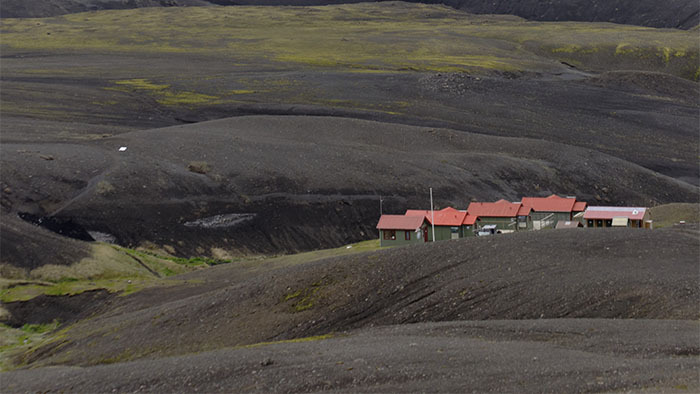 Wednesday, June 28th – we have the entire day to explore the amazing landscape of Landmannalaugar. You can hike up Bláhnjúkur, a nice little mountain with an amazing view, head out farther into the wilderness preserve, or just take it easy, drink coffee with “ze Germans” in the Mountain mall, hang out in the hot springs, or catch up on sleep. The choice is yours. Some of the treasures of the Mountain Mall. Thursday, June 29 – This afternoon the bus will pick us up and we’ll head back to reykjavik, where you have the rest of the day to shop for presents (Jon is the expert on Icelandic sweaters), take the elevator up Hallgrimskirkja (great view across the city), or soak your bones in the hot tub (and follow it up with three last hot dogs). It’s all up to you. Reykjavik’s skyline reflected in the windows of the new opera house. Yes, that would be another option. Friday, June 30 – One last chance to sample Icelandic pastries for breakfast (very sugary and delicious) before the bus picks us up for a trip to the Blue Lagoon. 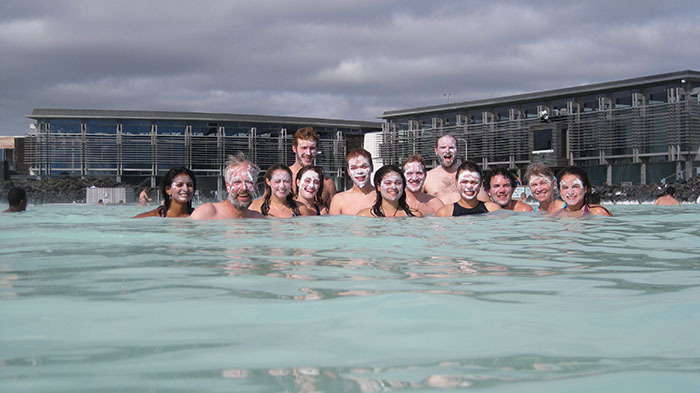 Here you can soak in geothermal waters, get a silica mud facial, buy expensive souvenirs and clean up, so your neighbors on the plane won’t hate you. From there it;s only a short trip to the airport and back to Boston. 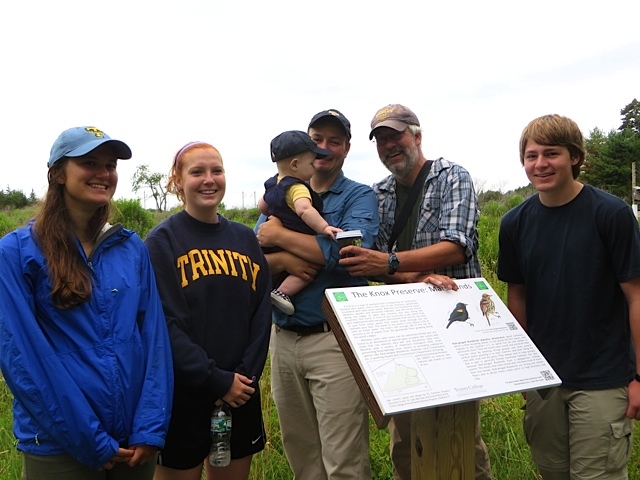 Jon and Christoph will be leading and organizing the trip, Amber will chase the elusive Icelandic salamander (Salamandra islandica heklaensis), while we expect Krista to identify every cinquefoil down to the subspecies level. 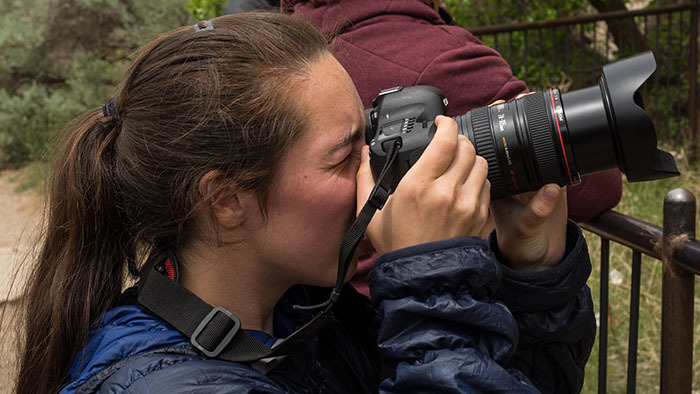 We here in the ENVS Program have always known that Cassia is an amazing student, researcher, softball player, and videographer (for her video of our Utah field trip click here, her video on Trinity’s summer research program is here), bit now it’s official: The Trinity Tripod, a highly respected publication in the field, named Cassia Trinity Artist of the Week. We would have named her Trinity Artist of the Month, but, hey, it’s a start. 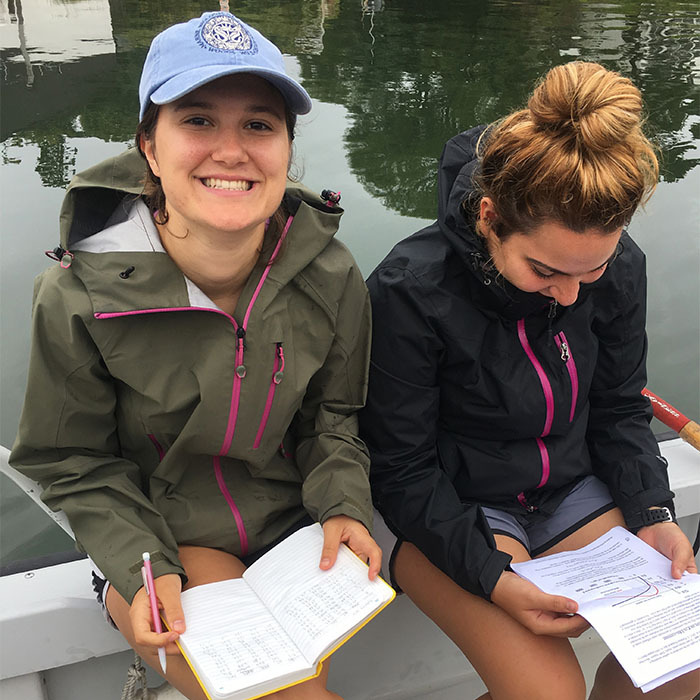 I am spending this semester at the Marine Biological Laboratory (MBL) in Woods Hole, MA doing a program called Semester in Environmental Science. Being the first Trinity student to do SES I had no idea what to expect. The answer is SES is amazing. So far I’ve had the chance to learn from scientists who are doing some amazing research on climate change, do some awesome field work, hang out with other science geeks, live on the beach, and eat obscene amount of lobster at the dining hall. That’s not to say the program isn’t intense. We’ve done more field, lab, and data work up in the last fifteen days than I’ve done in a full semester. We collect data in both terrestrial and aquatic systems meaning I’ve had the chance to try my hand at some cool data collection techniques and equipment. Already I feel like I have a better understanding of how to design experiments and collect meaningful data in order to answer research questions. Even more important, we spend a lot of time working with our data in excel. As a result I not only know how to collect data but I know what to do with it afterwards. I 100% recommend SES to any environmental science (or biology or chemistry) majors who are interested in pursuing research in the future. If you’re interested in applying or just want to learn more please shoot me an email. I’m having the time of my life and would love to see more Trinity students take advantage of this opportunity. 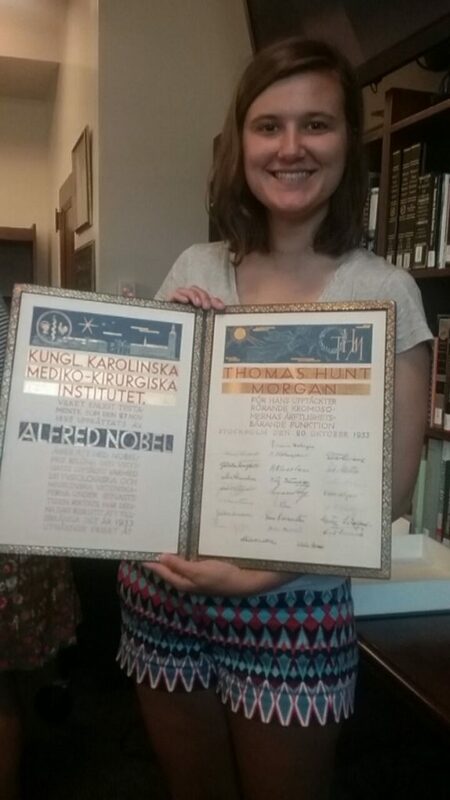 Four weeks at Woods Hole and already a Nobel Prize! As part of her work with Trinity’s Sustainability Campaign ENVS major Vanja Babunski made this video. Enjoy! 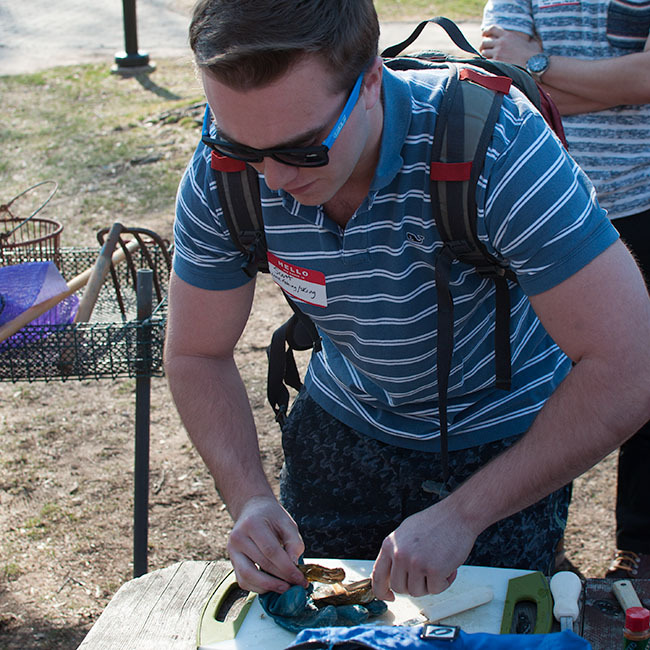 … the first oyster is almost ready to be eaten. 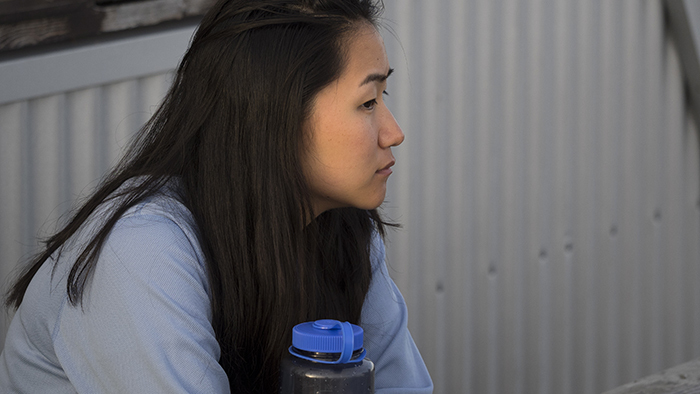 … and Lauren figures it out pretty quickly too. Needless to say, there were no leftovers. Thank you Ryan! To say that not much has happened since my last post is an understatement. To say that the transition from a sabbatical back to teaching was no big deal might be even a bigger one. I could get used to showing up in the lab each morning, doing a few measurements and thinking a few deep thoughts in my office… Needless to say, the last few weeks were a bit busy: we hired two new faculty members (more on that in an upcoming post), I am teaching three courses, and my research students keep me busy too. Nevertheless, I was in for a (very nerdy) treat this Saturday. 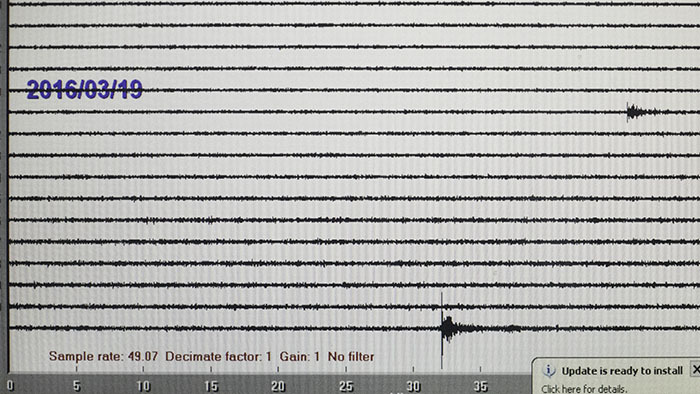 For years I have been walking past our seismograph, checked the screen and saw nothing, or noticed an earthquake that had happened some place on earth. “Nice“, I usually thought, “that was a big one, better check out where it happened…“. This Saturday, however, while packing the car for a quick sampling trip to Hammonasset State Park I saw the waves arrive while I stared at the screen. It was cool to think that for a few minutes the biggest vibrations in the building came from a place a few thousand miles away. I stared for a while, returned to packing the car (T.J. was supposed to show up in half an hour, so I didn’t want to be late), and snapped a picture of the screen a bit later. The earthquake, it turned out occurred at 11:26 UTC in the Caribbean, and you can read all about it here. Looks dry to me … how tricky can it be to get a core from here? 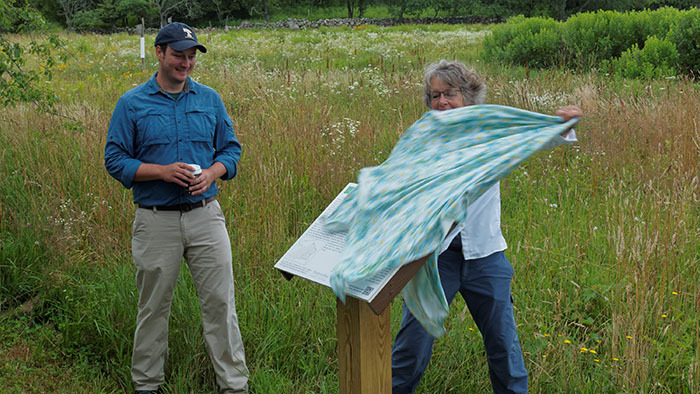 The sampling trip was exciting as well. 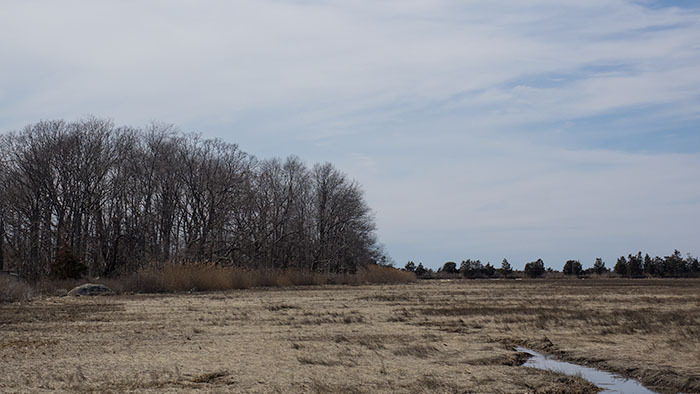 T.J. and I headed down to Long Island Sound to core a salt marsh in Hammonasset State park. We’ve been there before in the winter of 2014 when everything was frozen. 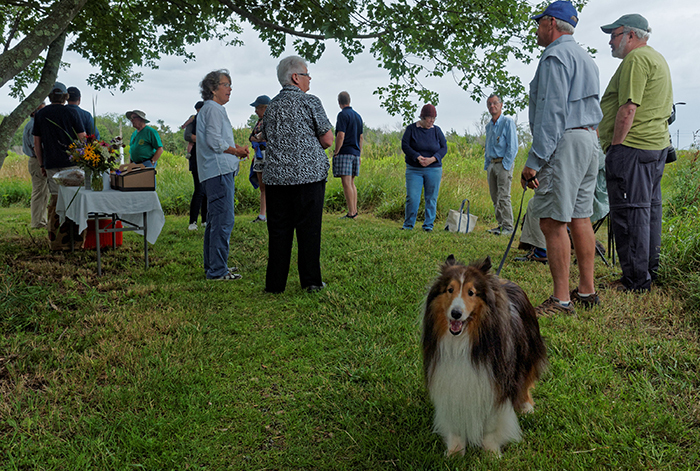 This time it was different: the marsh was one soupy mess. On our first walk out to the coring site, T.J. went in to his knees. On our second trip out I went in to my chest. That’s when I decided that the camera would stay on dry land. After a few more trial and errors we had it pretty much figured out and stayed dry – until we cut corners – and in we went again. 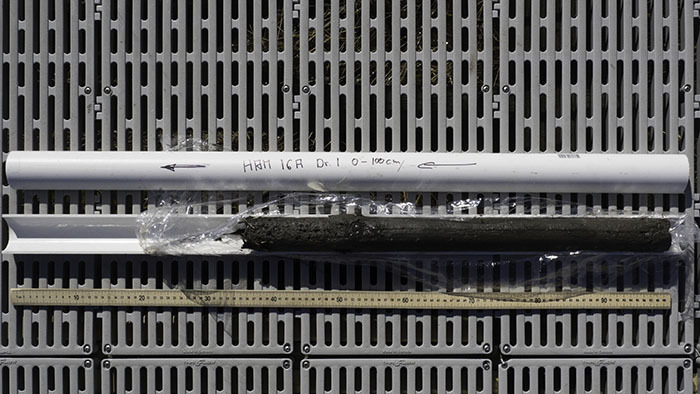 Nevertheless, we got eight meters of hideously smelly core with no bottom in sight. So, we might find ourselves some football players, hope for a colder winter next year, and return in January for a third try. In the meantime, T.J. will analyze what we have, and the cores will stink up the fridge, lending that particular aroma to McCookout stuff. Psychedelic core … HAM 16A – drive 1 – the first of eight beautifully smelly salt marsh cores. Whoever doubted that college is transformational better watch this. So much emotion within seven seconds. Way to go Emily! Now, what did Emily do, you ask? She participated in faculty research! What, you still don’t know what we’re talking about? 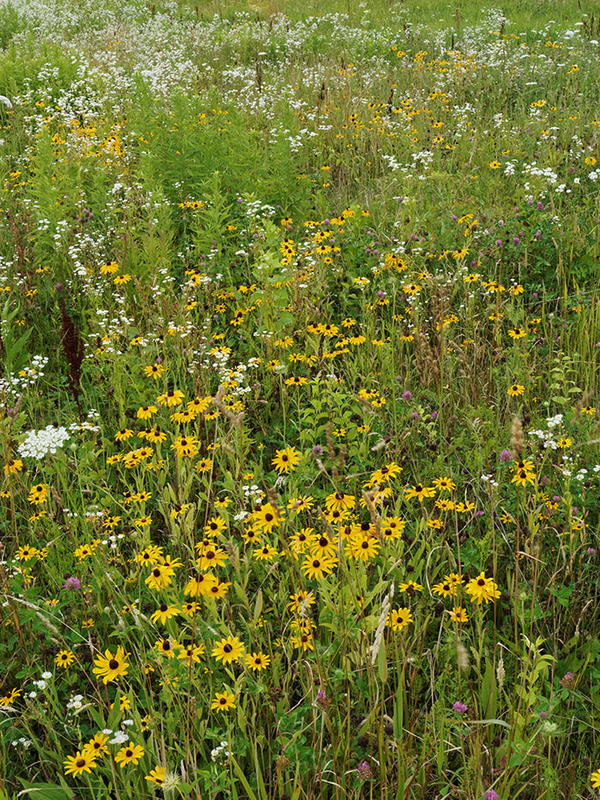 Click on the link to see the full seven seconds of transformations. 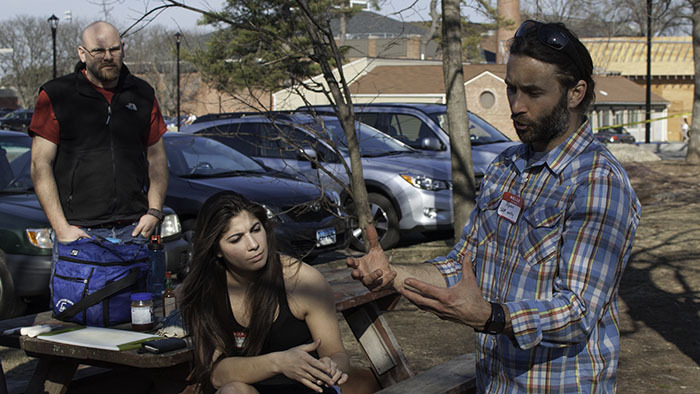 Nick Uline visited McCookout today, telling students about the Semester in Environmental Science Program (SES) at the marine biology Laboratory (MBS – these guys sure like acronyms ;-) at Woods Hole. 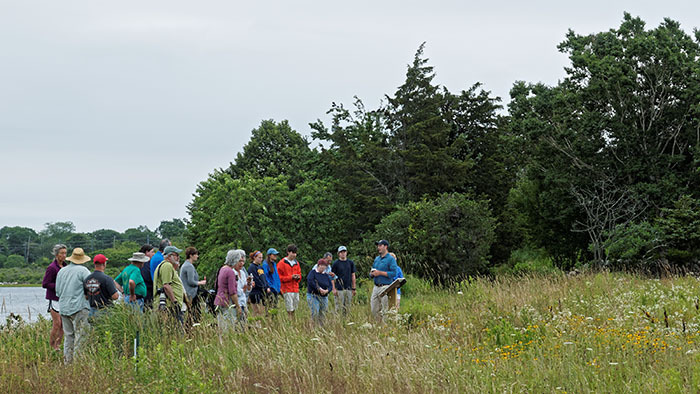 The program offers an exciting semester focusing on global change and biochemistry on Woods Hole’s campus on Cape Cod. 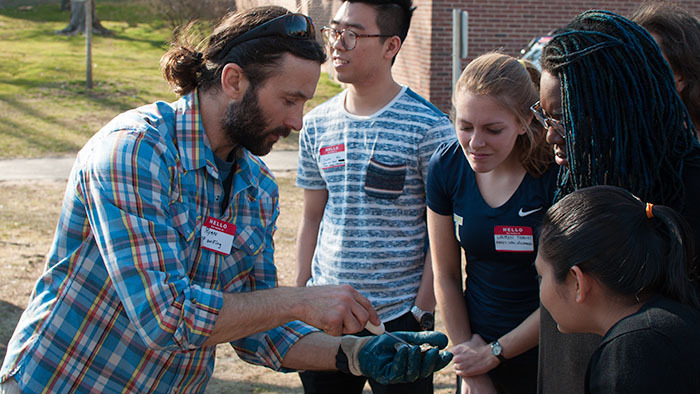 Our environmental science majors could transfer three courses which count towards their major. These courses would replace Methods in ENVS (ENVS 275L) and two electives. 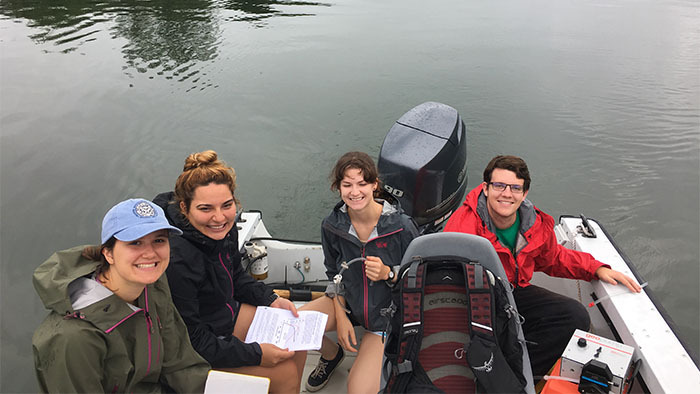 Since the second half of the semester is spent on an independent research project, our majors could also fulfill their integrating experience requirement at woods Hole and might even expand their project into a thesis. 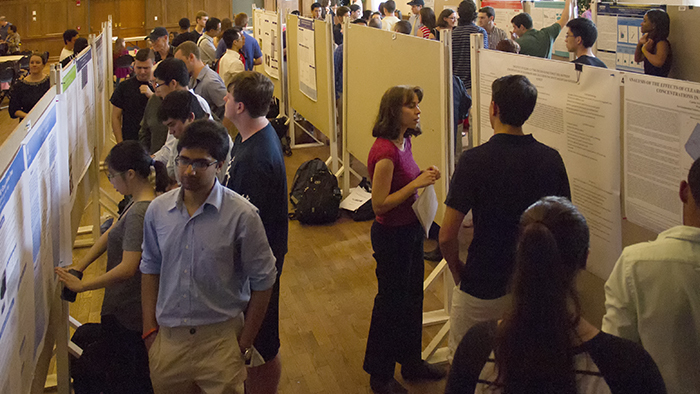 The program is a great opportunity for students who would like to go on to graduate school. 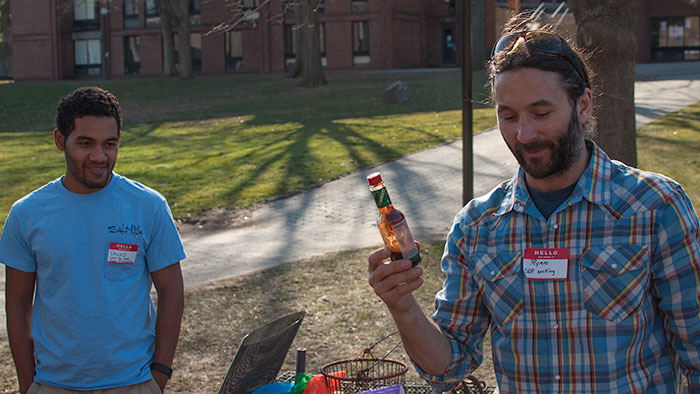 It offers plenty of great science and allows you to make the first connections in the graduate school world. You should give it some serious thought! 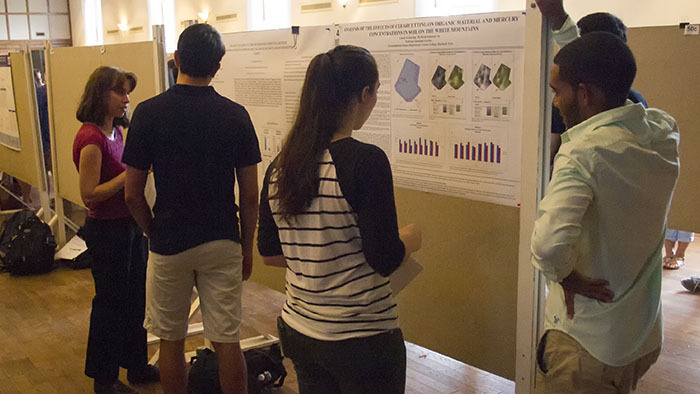 Today, during lunch hour, Jon’s summer research students Cassia, Jack and David presented the results of heir summer research to the wider College community. 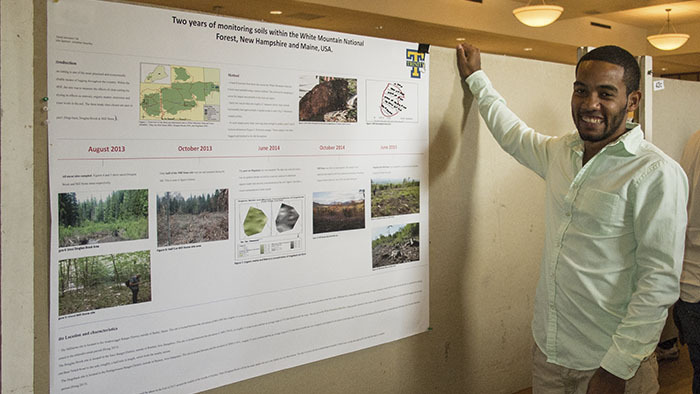 They had three posters outlining their ongoing research on the effects of clear cutting on Mercury, Aluminum and Calcium concentrations in forest soils. 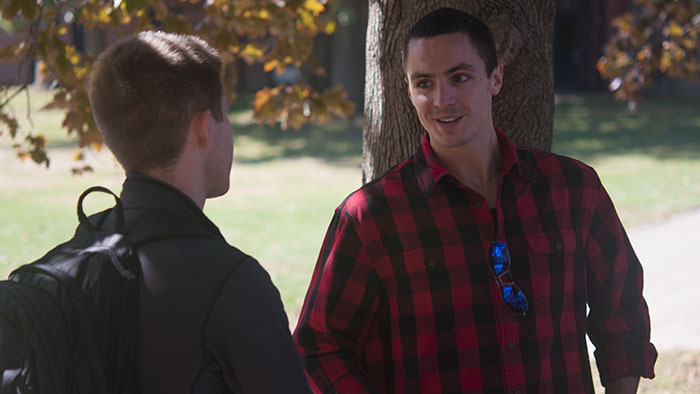 This research project, now in its second year, continues research initiated by Justin and Dan. 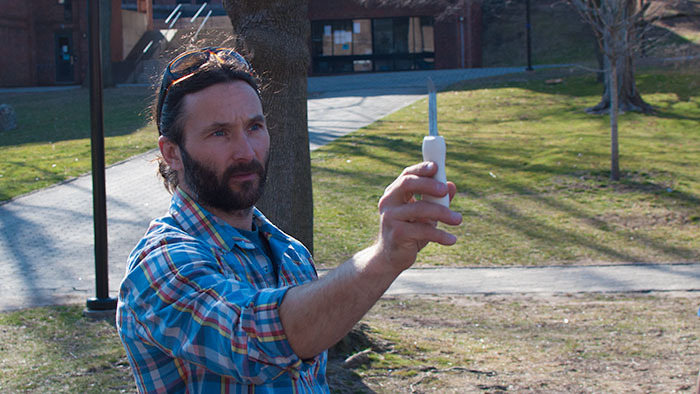 David presenting introductory information on the ongoing White Mountain research project. Cassia and Jack showed some of the first results. 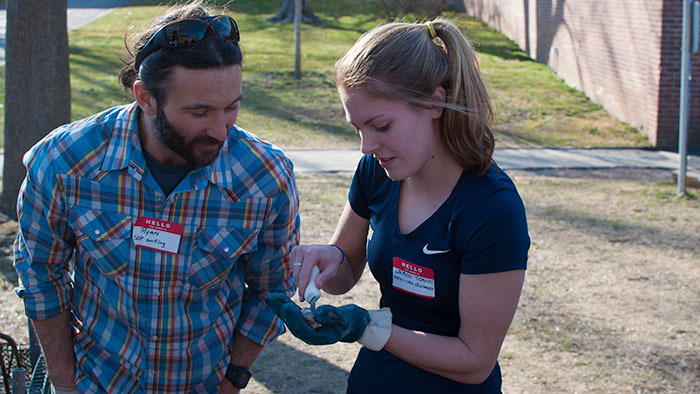 Cassia focused on changes in organic matter and mercury, while Jack presented data on Aluminum and Calcium. Jack and Cassia explaining the results of their summer work. Just in case you wondered: yes, Cameron’s crew was pretty busy too all summer. Jordyn presented their research in a poster presentation at the annual meeting of the Ecological Society of America (ESA) in Baltimore.